l'air de rien: Uccello, encore! Below, are the two other versions which are part of a triptych by Paolo Uccello. The top one is from Paris and the bottom one from The Uffizi in Florence. I have simply lifted the two texts from Wikipedia for simplicity sake. The bottom text is a biography of Uccello for those patient enough to get to it. I mean,... how many other people get crazy for looking at paintings? To be honest, I am less enamored with these two other versions, and to be fair, it may very well be that I am so in love with the version in the National Gallery which I know so much better as I have not seen the other two in many years. Also, it's only the National Gallery which has produced on its website this superb photograph of very high resolution which enabling me to pick details from it the other day. Lastly, I wonder if it has not been cleaned in the not too distant past? If so, it is a really marvelous job. And, looking at all three together, I cannot help the feeling that one of them is the real beauty at the Prince's Ball accompanied by her two plain sisters. The Uffizi panel was probably designed to be the central painting of the triptych and is the only one signed by the artist. The sequence most widely agreed among art historians is: London, Uffizi, Louvre, although others have been proposed. They may represent different times of day: dawn (London), mid-day (Florence) and dusk (Paris) - the battle lasted eight hours. The panels were a subject in the BBC series "The Private Life of a Masterpiece", 2005. This painting is just the central panel of a large triptych painted by Paolo Uccello approximately in 1438, now dispersed and divided between the Uffizi, the National Gallery in London and the Louvre in Paris. 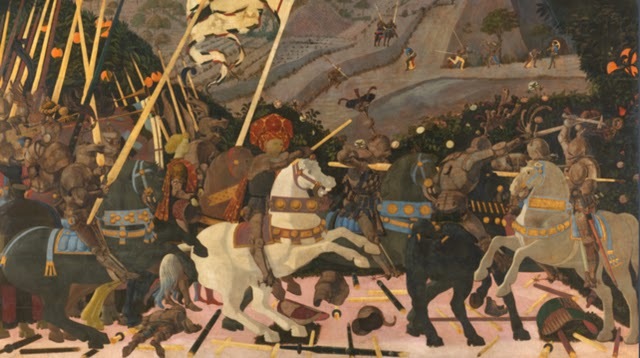 The cycle depicts three events occurred during the Battle of San Romano that took place in 1432 between Florence and Siena and that marked the glorious victory of Florence. The work was commissioned by the wealthy Bartolini family but in 1492 it was included already in the inventory of Lorenzo de’ Medici, known as “the Magnificent”. What makes this cycle a masterpiece is the bold and experimental use of the perspectivewho made Uccello famous. The panel of the Uffizi depicts the unhorsing of Bernardino della Ciarda, leader of Sienese mercenaries. The soldier is the man on the white horse just in the center, hit by an enemy spear. The composition is very crowded, but despite that the atmosphere is somewhat unreal and the knights look like fake dummies of a medieval tournament. Paolo Uccello is more interested in the perspective and its application than in the human feelings. The naturalistic details, the hunting scenes in the background, the finicky description of the armors and the horses remind us of the fairy-tale gothic aestethics. Paolo Uccello is indeed an important transition artist, fully in love with the Renaissance revolution of Renaissance but winking at the gothic tradition. 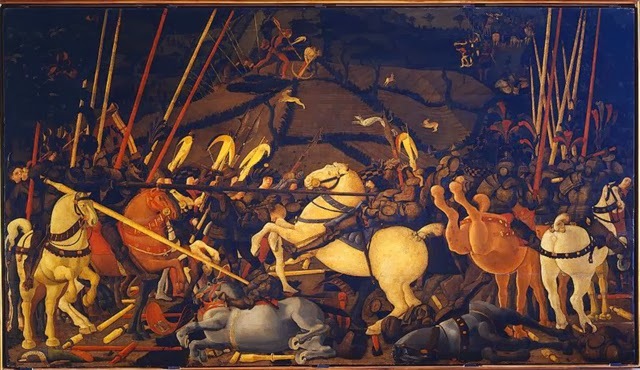 The Battle of San Romano by Paolo Uccello has been recently restored, but in November 2012 it has been replaced in the hall #7 of the Early Renaissance. 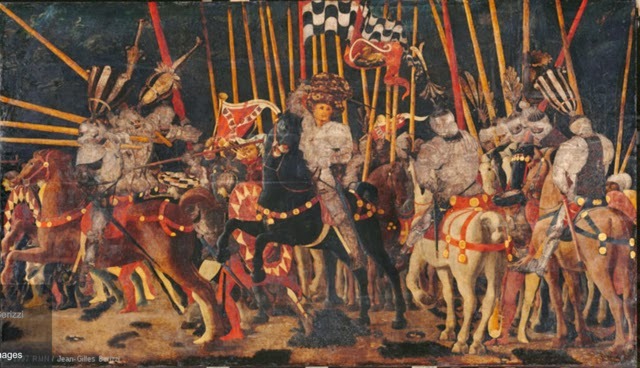 In the London painting, Niccolò da Tolentino, with his large gold and red patterned hat, is seen leading the Florentine cavalry. He had a reputation for recklessness, and doesn't even wear a helmet, though he sent two messengers (the departure of the two messengers, depicted centre, top) to tell his allied army of Attendolo to hurry to his aid as he is facing a superior force. In the foreground, broken lances and a dead soldier are carefully aligned, so as to create an impression of perspective. The three paintings were designed to be hung high on three different walls of a room, and the perspective designed with that height in mind, which accounts for many apparent anomalies in the perspective when seen in photos or at normal gallery height. Many areas of the paintings were covered with gold and silver leaf. While the gold leaf, such as that found on the decorations of the bridles, has remained bright, the silver leaf, found particularly on the armour of the soldiers, has oxidized to a dull grey or black. The original impression of the burnished silver would have been dazzling. All of the paintings, especially that in the Louvre, have suffered from time and early restoration, and many areas have lost their modelling. I'd never seen the other two versions! Wouldn't it be great to see all 3 together in the same place? The black horse in the top one is beautiful, and the kicking-backward brown horse in the middle painting is terrific (both funny and real), but the NG version is by far my favorite.